Unlike most home improvements, roof repair, maintenance and replacement are best left to a local roofing company. 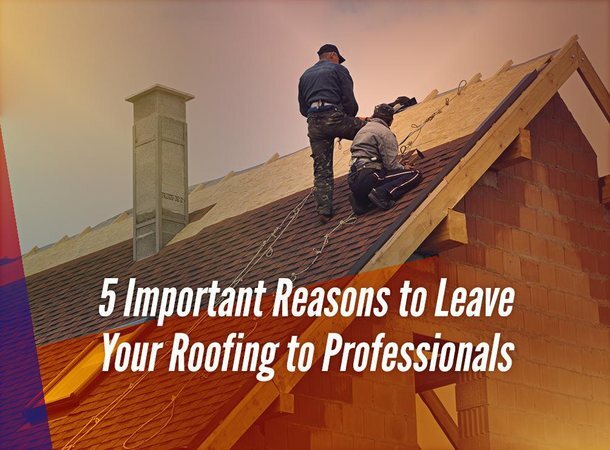 The benefits gained from having your roofing needs addressed by local professionals far outweigh whatever amount you might save if you had go with an amateur from out of town. You Get Professional Quality Work – If you need just one reason to hire professionals to address your roofing concerns, it’s because professionals provide professional results. At Knox’s Construction, we hold certification and training from a leading manufacturer like CertainTeed®, which means all our installation work meets or exceeds these companies’ high standards. Our roofing installations are also eligible for full warranty coverage on both materials and workmanship. It Can Be Dangerous – It’s never a good idea to risk injury by climbing up on your roof. Roofing professionals have the training, equipment and knowledge of safety practices to safely climb roofs, regardless of slope. We Have Insurance – Another reason not to risk your well-being is that your insurance premiums could take a hit if ever you get injured. When hiring a roofing contractor, verify if their insurance coverage includes workers’ compensation. At Knox’s Construction, we have both general liability coverage and workers’ comp, so if property damage or injury occurs, you know we have you covered. You Risk Voiding Your Existing Roofing Warranty – Modern roofing warranties clearly indicate that any unauthorized repairs could void it. If you’re unsure, better be on the safe side and just have repairs done by professionals. This is one of the things we look out for when performing roof repairs, even if we weren’t the ones who originally installed the roof we’re working on. Your Roof Will Last Longer – Whether it’s a minor roof repair or a complete roof replacement, professionals always aim to provide long-term roofing solutions, including rooting out potential roofing problems and helping our customers plan a maintenance program. This ensures they will have a roof that protects their home regardless of outside conditions. Ensure flawless roof repair and replacements by turning to Knox’s Construction. Call us today at (724) 941-8219. We serve many areas in and near Pittsburgh, PA.